Serve salmon fillets with a light vegetable broth made with pak choi, peas and beans. Add a herb and garlic mayonnaise for extra flavour. Mix the mayonnaise with the garlic and half the basil, and season with a little black pepper. Place the stock in a large pan and bring to the boil. Add the fennel and simmer for 5 minutes. Meanwhile, heat a large non-stick griddle or frying pan and spray with a little cooking oil. Place the salmon pieces in the pan, skin-side down and cook for 4-5 minutes until the skin is crips. Turn over, season with black pepper and cook the salmon for a further 4-5 minutes until the flesh is opaque and starting to flake. Tip the pea and bean mix into the broth, bring back to the boil then add the pak choi. Simmer for 3-4 minutes until the vegetables are just tender then season to taste. To serve, ladle the vegetable broth into 4 bowls. 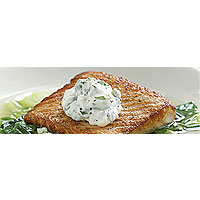 Scatter over the remaining basil, then top with a salmon fillet and a spoonful of garlic and basil mayonnaise. Try using other vegetables in the broth, such as asparagus tips, or replace the basil with chopped fresh mint.